HP 50G F2229AA Expert Reviews - Read Reviews and Buy Smarter Online. Verdict: There are more than 2,300 integrated functions in this graph calculator, including advanced functions like scatter plots, 3D graphing, angle conversions, hypothesis tests and symbolic differentiation. This makes it useful in high school and college courses in math, science, statistics and business. Verdict: A little nicer aesthetically than the TIcalculators, the HP50g offers a computer algebra system and has great performance at a low price. It uses a 75 MHz ARM9 processor and can be hooked up via USB. It even has an SDslot. HP 50G Goes Through the Batteries... Extremely disappointed! Verdict: I had a HP 48SX for approximately 20 years, and loved it; I had used it as an engineering student and continued with it in my professional career. Considering my own experience with this new version of HP's graphing calculator, the HP 50G, I am very unlikely to every buy another HP calculator. Verdict: Very powerful and flexible tool once you start to learn the many possibilities. May be frustrating at first if you are looking for quick basic scientific functions. The HP50g is a mix of calculator-computer that need practice but it is worth it. 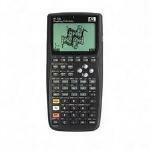 Verdict: The HP 50g is an exceptional graphing calculator that is capable of all mathematical functions required from high school through professional work. Using this calculator to perform engineering design work is very easy. RPN is very easy to learn and helps me to think about what I am calculating. Verdict: I use this calculator for engineering analysis and financial calculations. It is a replacement for an HP 49g+ which has worn out after about eight years of daily use. The keys have become unreliable. Verdict: Very useful produc, but how can know if this product is available in my local store or only online?? Why aren't there more sales resources for the 50g? Verdict: This is the best calculator (or handheld computer) on the market, and yet the only way I obtained it was that I found out about it through my father, a surveyor who uses his trusty 48gx as a data collector. He hooks it up to his instrument and does surveying with it all day. One of the most powerful calculators at present with RPN mode existence. Verdict: One of the most powerful calculators at present. Almost boundless opportunities of numerical and symbolical calculations, and as programming. Low power consumption. RPN mode existence. The only minus of this model is a complexity of development. Pros: This was purchased in 2007 to replace my 1986 HP 15-C that developed a cracked screen (out of the blue). it would still work but display was unreadable. No way to replace that display, even if I tried. Verdict: This is my 2nd HP calculator I've owed. A must have for professional scientists/engineers and students. The built in equation library is extensive and most with pictures to help descibe. While the RPN can be difficult at first, you can switch to "tradional" mode. Verdict: I bought and used a Texas Instrument TI-89titanium before I bought this. It was a fine calculator, but the HP-50g lured me in with people commenting on how RPN would "change your life". Well ok, they didn't say that exactly, but you get my point. HP 50g: What a steal!! Verdict: I bought a HP 48gx about 12 years ago. For $200.00. At a discount store. I spent $118.00 on this calculator. It has seven lines available on the screen versus four for the 48gx. Like the 48gx, the 50g uses AAA batteries.